Our website offers building instructions for a number of different bird aviaries. 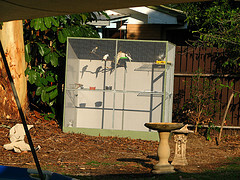 But with this article, we’ll be focusing on those who want to know how to build a parrot aviary. Alternatively, if you’re looking to buy a parrot cage then check out this page here. A larger size is needed for parrot aviaries over normal aviaries since they themselves are much larger than the average bird. With this increased bird size also comes more strength, intelligence and curiosity – so more durable and resistant building materials are needed.